Talk to Momodi in the Quicksand to get this FFXIV main scenario quest started. She sends you to the chocobo stables to do a little investigating. At the stables, talk to Rururaji to start a cutscene. At the end of the cutscene you're given the task of protecting a group. This part of the quest is horrible if you're a Disciple of the Hand or Land – it shouldn't be a problem at all if you're a combat class. (Also, important to note: people have reported that the NPCs can be healed using AoE heals, though they can't be directly targeted.) The good news is, if you die, you just have to go talk to Rururaji again and he'll teleport you back into the fray where you can start over again. For non-combat classes, talk to Niellefresne and he gives you a pinch of gold dust. Use that gold dust on a Minemite that's at full health and it'll simply follow you. Drag it over to Greinfarr so that his AoE will damage it and pelt any other target with rocks. This is a very frustrating method and may take several attempts, but it is possible to make it work; at the end of my attempt, both Greinfarr and Niellefresne were almost dead. And it is important to pay attention to Niellefresne's health; some of the Minemites will attack him, and he will just stand there with his back turned and allow it to happen. For added annoyance, the way to use the gold dust is to first talk to Niellefresne, then use the "pinch of gold dust" option that appears above your main menu and target one of the Minemites. Only one pinch of gold dust can be active at a time, and you have to wait for one pinch to wear off (this message shows up in the chat window) and then talk to Niellefresne to get another. 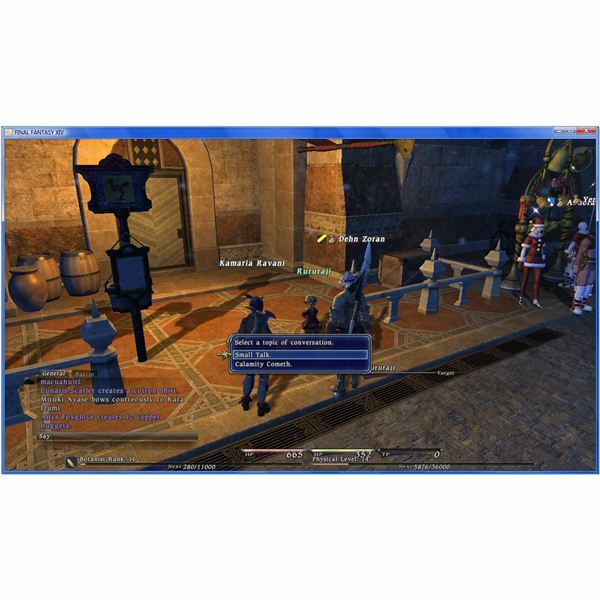 With the Minemites defeated, talk to the NPCs until you are teleported back to Ul'dah. The next leg of the quest is to go to the Alchemists' Guild to check on the wounded. Talk to Nogeloix at the front desk and he'll send you to the back rooms. This should be a familiar place after Court in the Sands. A short cut scene will begin after you approach the back room. Afterward, you will be in the mini-map-less back hallways once more. Head for the end of the hallway, then turn left; up the stairs there's an NPC called "Chapeued Chap." Go up the stairs, hang a right, and go into the door there to start the next cutscene. If you go over to F'lhaminn and sit on the bed, it magically transports you from the word. Yeah, I don't know. Run back toward the entrance to the hallways and start up a cutscene. At the end of the cutscene you will be transported out of the back hallways, and Momodi will want to talk to you via the NPC linkpearl. She sends you to Camp Black Brush; teleport there. In the camp, run by Nomomo to get a cutscene to begin. Teleport back to Ul'dah and head to the Thaumaturges' Guild. A cutscene will begin as you approach the guild entrance. An instance begins after the cutscene. You are transported outside of the Guild; run back toward the front door and start the next cutscene. Get out the popcorn and hold on to your hat; this cutscene is amazing. At the end of the cutscene, you wake up to Momodi's smiling face. 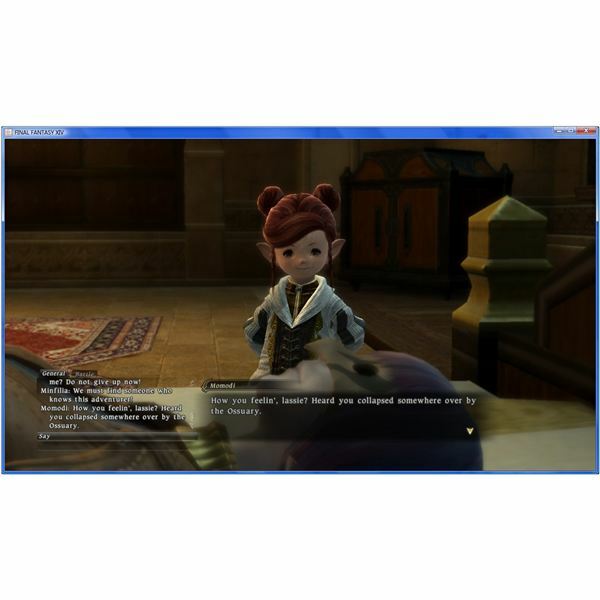 Finish the conversation with her and you get your reward – and the FFXIV main scenario quest is completed.